I'm Jamey Brzezinski, San Francisco Bay Area artist, musician, writer, and curator. My paintings, drawings, and prints have been shown in well over 150 solo and group shows in the USA and abroad and are included in several significant public, private, and corporate collections including the Fine Art Museums of San Francisco, the Pratt Manhattan Graphics Center, and the Saudi Royal Family. My work has been represented by top galleries and dealers in San Francisco, L.A., D.C. and other cities. Over the years I have been been fortunate to have been selected for several large scale public commissions and to have been able to published numerous technical and critical articles, essays, and one short story. Currently I am finishing my first novel, Choirboy. 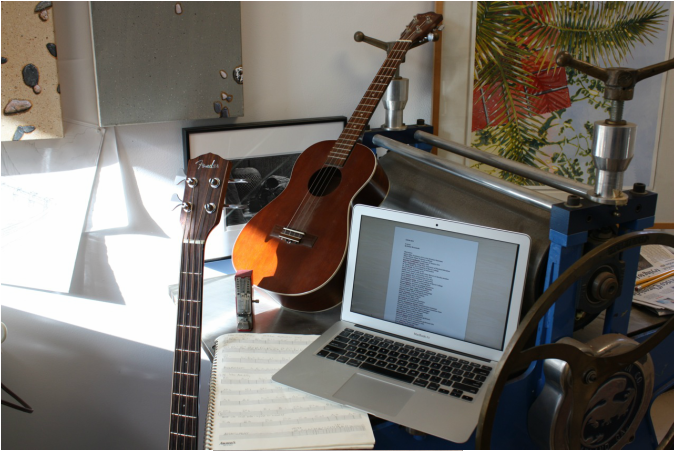 I enjoy composing original jazz arrangements for bass guitar and baritone ukelele and recently became an Emeritus Professor at Merced College, where I chaired the Arts Division (art, music, and drama departments) for 12 years. In the past I have also taught studio art for San Francisco State, U.C. Davis, California College of Arts (CCAC), Santa Clara University, and other schools. Currently I curate art exhibits for the galleries in the Milton Marks Conference Center in the Hiram Johnson State Office Building on Civic Center Plaza in San Francisco and divide my time between my studios in Pacifica and Mariposa, California.